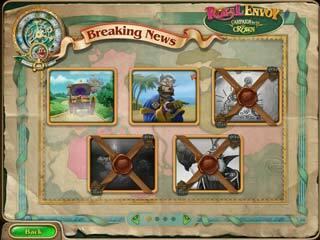 Royal Envoy: Campaign for the Crown Collector's Edition is a time management game with a kind of dramatic story. The story is presented with all the fun details just like in the previous releases. If you are new to the series and you like this one, you should check the rest of them, too. The reputation of the king is being damaged by this other gay, so you will have to fix quite a lot of what he has ruined. The destiny of the king in the kingdom is in danger. Just like presidents in real life the king will now have to try and win the elections in his favor. All this because of some figure who challenged the king to prove that he deserves the throne that can otherwise be overtaken by him. So now you are taking care of the king's political campaign. 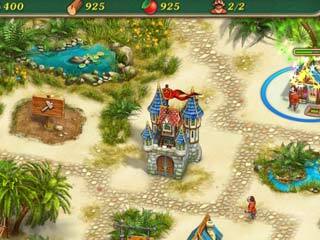 The game's graphics are of course bright and colorful as you travel through the kingdom, which fit the story and the genre in general. The musi is very lively in a fairy tale kind of way. The voice overs are dove very appropriately, too. The reputation of the king is being damaged by this other gay, so you will have to fix quite a lot of what he has ruined. Building will be a great part of your campaign, and that includes buying materials, producing materials, hiring workers, supervising the process etc... There have been a few changes made in the mechanics of the gameplay to make it easier. There are a lot of achievements and tasks to fullfil. The game features some extras, like an animated screen saver and wallpaper. There's a walkthrough available for you, which is helpful at times especially for achieving the goals. The game is one of teh great ones of the timemanagement genre. It is definitely worth the time and serves as a good change even if you are a fan of HOPA games. This is Royal Envoy: Campaign for the Crown review. Download this game here.